I was asked by a reader what I do for a workout when one pulls their hamstring. Of course, it depends on the severity of the pull. I emailed him my Hamstring workout for rehab, which he later sent to his REAL coach for approval. To my surprise, my workout was NOT approved. If you believe in me, take a drink from the Kool-Aid Gatorade jug and read on. One of the “treatments” to resume training after a hamstring injury is called “turnarounds”. You set up 2 cones 10m apart on grass. Then you run 10m to the cone (yes, even with the sore hammy) then slow down, stop, turnaround and do 10 reps total. That’s one set. Take a break and do 4 to 6 sets, building up to 10 sets over the course of the injury, or 10 x (10x10m) for 1000 meters of total volume. Once you can do 10x10x10m, if the hamstring isn’t “grabbing” at 10m, try to extend the cone to 15m, for 7 x 15m. Again, 1000 meters of total volume. Repeat daily or every second day until you finish the workout without pain in the hamstring. Do NOT advance the distance if the hammy grabs or hurts. This may take a few weeks. If the hammy is a bit tender, you can always cut back 5 meters. The logic of the workout is the injury occurred during “backside mechanics” and the short distances (10m) is all acceleration work and “front side mechanics”. Thus it should NOT interfere with the rehab process. Of course, credit should be given to Gerard Mach who introduced my coach to this hamstring rehab workout. I remember you sending me this workout over the winter. I pulled my hamstring (upper at point of insertion) 5 months ago. It still is bothering me; running 5 minutes at a jogging pace even aggravates the muscle. Hamstring curls with minimal weight even spark a lot of discomfort (which was a core part of my treatment plan). My question is: If its “grabbing” at me running at 8 min/mile pace would doing this workout be any different? @Austin, I think you should try the workout and see how far you can go without grabbing. It may be only 10m. Also, have you had this injury diagnosed properly? Is it in the muscle? tendon? maybe a sciatic nerve problem? Right on the mark Jimson…. @Jimson, A chiropractor told me I pulled my hamstring at the upper point near the tendon attachment(possible avulsion), and also 4 inches down from there. I have an appointment with an orthopedic surgeon in 2 weeks, so hopefully this issue can finally be addressed. I’m going to hold out on any leg work/running until then. Many thanks for sharing this. I had heard of Gerard Mach’s ideas on hamstring rehab but not what an actual workout would look like. But I don’t entirely agree with your reference to “frontside” and “backside” mechanics. Acceleration is mainly “backside” mechanics, pushing down and back. It’s when you get into an upright position when you will see more “frontside” mechanics with the feet coming in front of the trunk or even knee, which stretches the hamstrings. The most vulnerable position for the hamstrings is landing with the feet too much in front of you and low hips. This can be caused by different things, pushing out the back too much is certainly one of them. and when you land poorly, puts them in a vulnerable position. @Mike, I am working on part 3 of the article. I can attest to the effectiveness of the controversial hamstring workout for rehab as it worked wonders for me whenever I tweaked my hamstring. I’ve determined that the worst thing for rehabbing your hamstrings is to baby them. You have to tell your body to get moving again and I believe this program works. @Ed, agreed on the pain part. There was a TV series in the 1970’s called “Happy Days” when Fonzie gets in a bike crash and hurts his knee. He should have been up within a week, but was afriad of the pain associated with the rehab, and just ended up sitting around (with girls as his harem) pampering him all day. At the end, he didn’t get better. Moral of the story: you gotta get out and move that body. Add more nutirents and circulation to the injury. Would you still recommend this workout(which would be in-conjunction with PT)? Can you apply the same principle (stop before it hurts) to recovering from an Achilles/heel injury? Is complete rest a better option? (Or have you already addressed the issue?) Thanks. Your website was referred to me by an athlete at the sprints club. I am 39. 40, next March. I only took up Athletics January 2010. 100m – 11.7; 200m – 23.4 and long jump 6.56m. I am just an ok athlete, but not good enough. I injured my left Gluteus Maximus July 15th & Sept 15th. Since then I’ve had about 12 visits with a Chiropractor, then followed by a thorough examination at Loughborough university, England on 16th Sept – If you would like to see a copy of the report, I am happy to send it to you. Would be kind of you to read the screening report compiled by Loughborough University Physio-therapy dept, and see if your expertise could pay didvidends. I didn’t want to waste your time, that is why I am writing to you. It’s the 7th of November, eventhough, I have only just started the new season, coupled with going to the gym to strengthen my glutes, I am still experiencing pain. A Doctor in Med Science, is trying to introduce me to using a form of Western acupuncture call intramuscular stimulation (IMS). Do you know much about it. Your advise and assistance would be greatly appreciated. Gerry Ramogida works at the “other” UKA high performance center (not Loughborough). He’s the best in field as far as I am concerned. I wouldn’t use this rehab program. Reason? Acceleration uses different muscle groups than running at top speed. At top speed, the quads are almost idle. 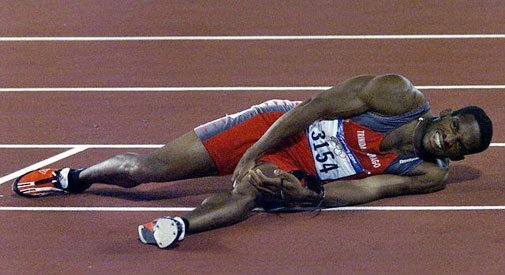 Too much of acceleration drills will turn you into a “quad-runner”. Yep, speaking from experience. @Heman, thanks for your input. What do you suggest? Got a minor hamstring strain just over a week ago in the middle of the biceps femoris. Therapist said no tears and really no inflammation either but really tight and we did some needling to loosen up. I started doing these drills recently. I just realized though that I was running the 10m and walking back to the start and repeating. Anyway, my question is regard to speed of these? I have been staying upright and focusing on the running over hot coals at about 50% intensity.